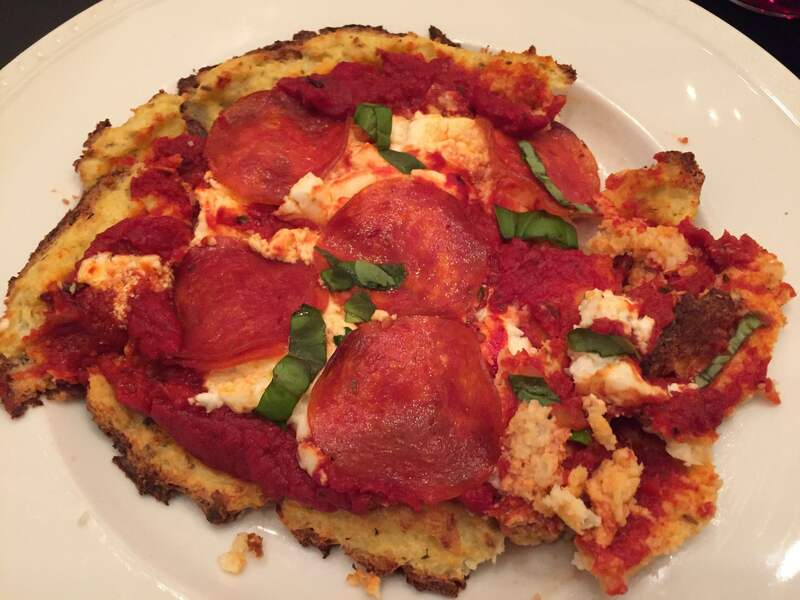 Using cauliflower for your pizza crust is a nice low-carb, gluten-free option The crust tasted great but didn’t hold together that well. 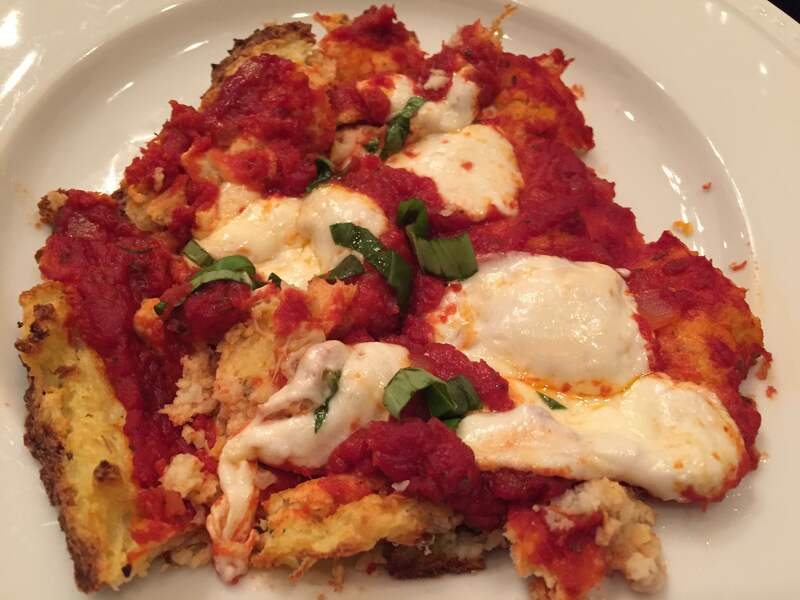 We’ll just rename this “Rustic Cauliflower Pizza Crust.” There are some explanations for what went wrong below. We would definitely eat this again, though. 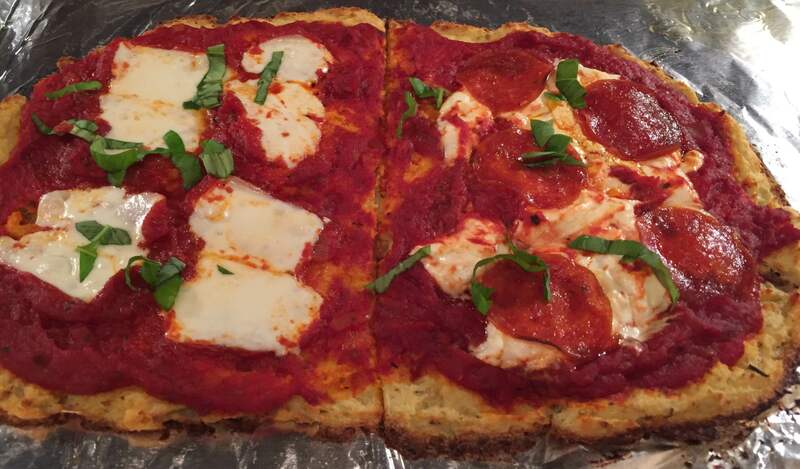 I found the recipe here: The Secret to Perfect Cauliflower Pizza Crust. It might have been perfect if I’d followed all the instructions in the recipe. 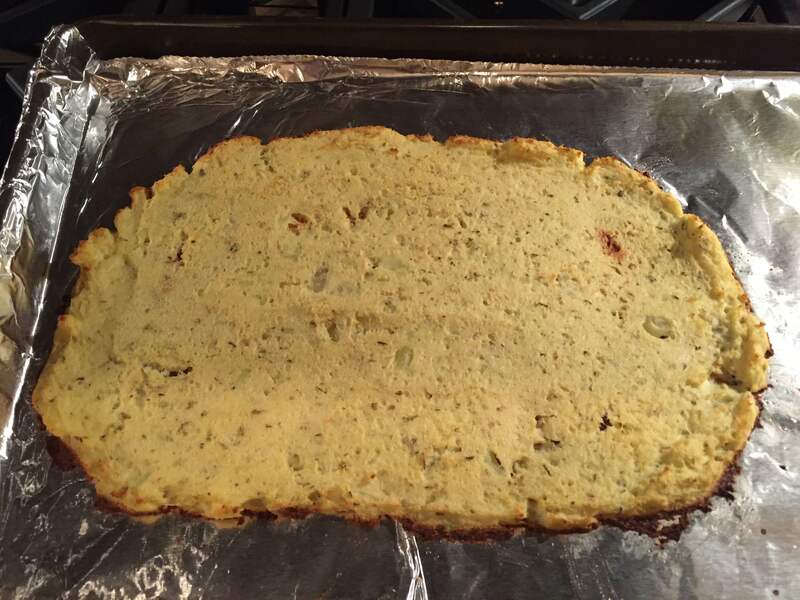 But, I had about half as much cauliflower as this calls for, so that resulted in a thinner crust, which just doesn’t stay together as well. Also, I did not have parchment paper on hand and instead used foil coated with olive oil, and the crust stuck like crazy to that. Next time I’ll follow the directions. Lesson: you’ll probably have the best results if you stick closely to the recipe in the link above. I’m going try it again soon. I’m not going to rehash the recipe in it’s entirety here — just follow the steps in the link. Below are a few pics of some of the steps. 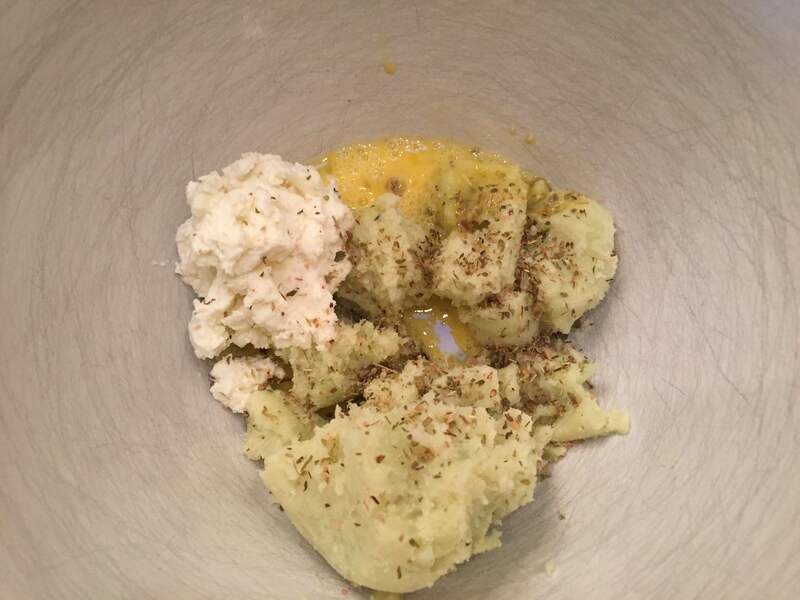 First step: ricing the cauliflower in the food processor. Many grocery stores carry bags of riced cauliflower — that would be an easy way to save time here. 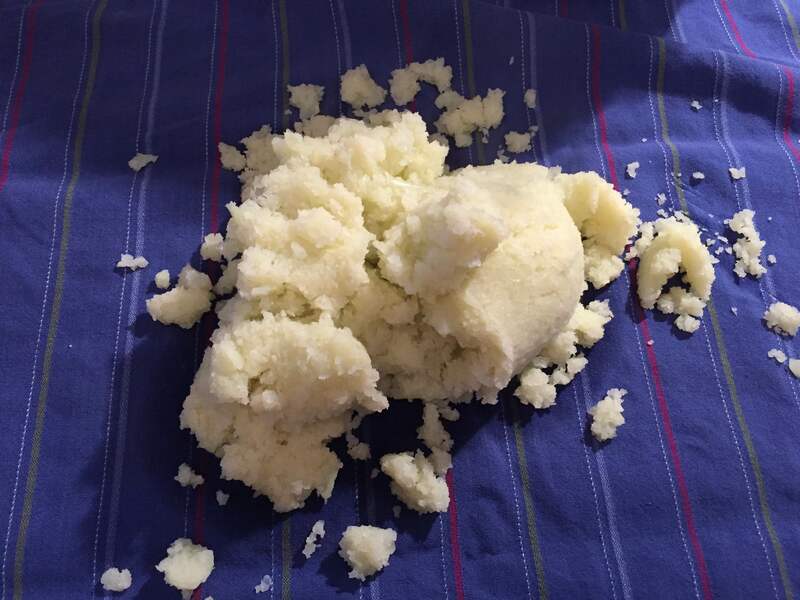 After boiling the riced cauliflower for 4-5 minutes, you need to strain it and wring it out in a dish towel to remove as much water as possible. 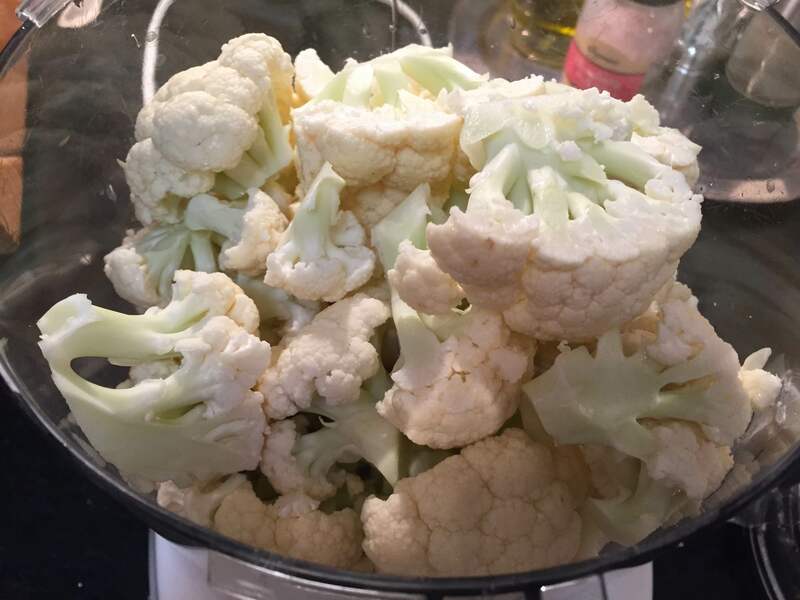 The dish towel technique definitely removes tons of water — more than I could get out just by pressing the cauliflower against the sides of the strainer. Next, you add the binding agents of egg and goat cheese, along with some seasoning. 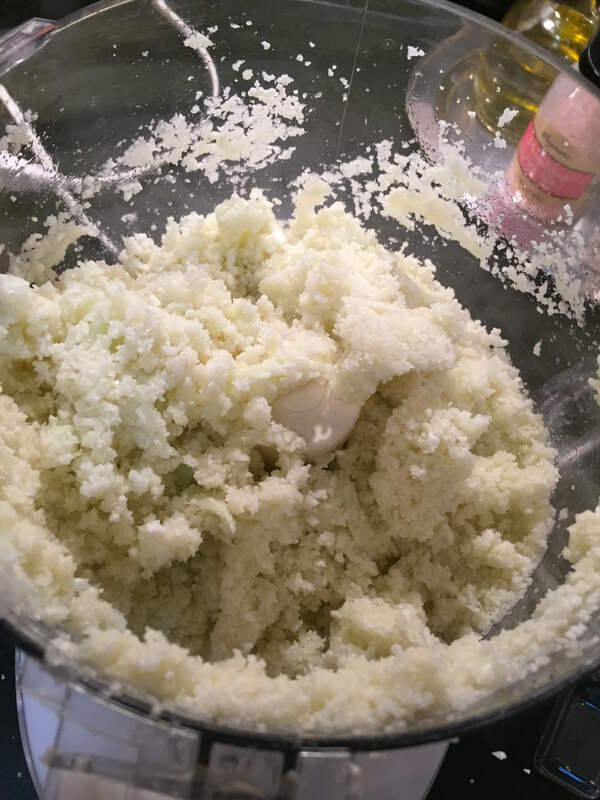 I did not decrease the amount of egg and goat cheese even though I only had the half the quantity of cauliflower. This may have been the reason the “dough” was so sticky. 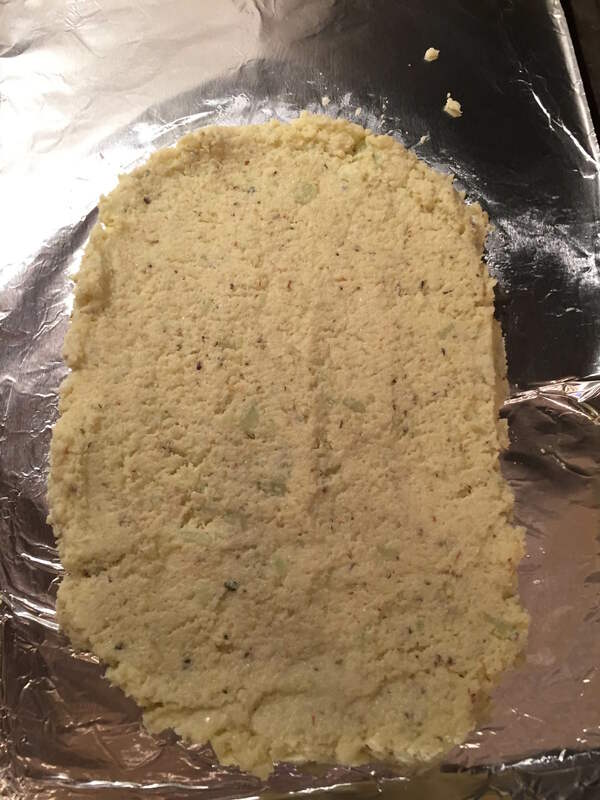 After mixing the dough, spread it on the baking sheet and bake. Next time, I’ll be sure to have parchment paper for this step. It was hard to get the crust off the greased foil. And here’s the baked crust. Saute the shallots in olive oil until starting to brown. Add the rest of ingredients and simmer together until ready to add to pizza (this makes a big batch of sauce). We topped half the pizza with goat cheese and pepperoni, and the other half with fresh mozzarella. Added fresh basil after it came out of the oven. The crust sticking to the foil created some crumbling, but the pizza still tasted great.